The results are in from our 2018 Family Business Survey, What are the key challenges facing family firms across the UK today? With around 5 million family businesses in the UK today employing around 12 million people, it is easy to see why family firms are referred to as the engine room of the UK economy. Family businesses operate in all sectors and in all corners of the UK, some firms larger than others, some new whilst others have been around for generations. They have a daily impact on the way we live our lives, from the milk for our breakfast, to the way we travel to work, how we keep fit and the way that we are entertained. They help shape the nation creating income, wealth and employment across the country. Having said that, family firms are unique, partly because of the way they are owned, but also as a result of the way they are managed, the way decisions are made and the culture that they create. Very much part of the fabric of the communities in which they exist, family firms also face unique challenges and we wanted to use this survey as a way to better understand the agenda for family businesses today. We often hear from family business owners that they feel alone in contemplating the way forward and how to manage their business, yet we also know that shared insights and knowledge are a great way to learn. 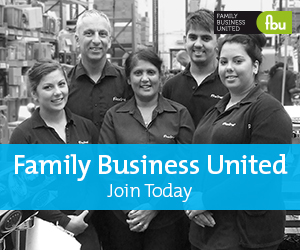 So what are the challenges and what is the pulse of the family business community across the UK? Our survey not only sought to find out what keeps family business owners awake at night but also looked at four key areas of concern in more detail: enhancing shareholder value, strategic matters, digital and the family business brand. Collectively, we wanted to give family businesses a voice, to understand the state of the family business nation and to better appreciate the concerns of this rich, vibrant, diverse sector of the economy. Family businesses are really important to the economy, nationally but also regionally and the findings from the survey will help in determining the family business agenda and shaping the development of events and resources to help them deal with their challenges too.